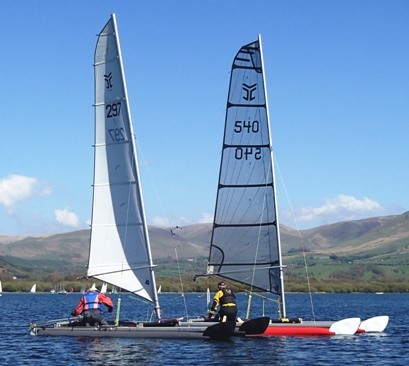 Catapult returned to a favourite event, the May Bank Holiday TT at Bassenthwaite with the ten-boat fleet including new member Marcus Reuber, completing his first races. The record UK temperatures and sunshine gave a challenging mix of light shifting breezes, with a light-moderate SW settling in each afternoon. The Bass RO set the traditional complex courses (assisted by a lead Rib.) The big lake usually allowed the Catapults and club boats to spread out, but clumps at marks, and the Flying Fifteens with similar speeds in the light airs, added to the tactical questions. 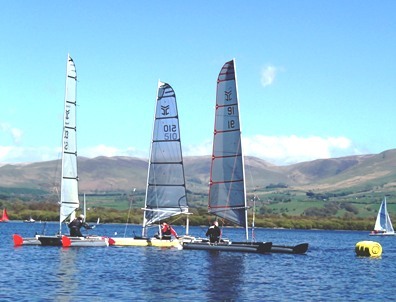 For Race 1 on Saturday in a light shifting westerlythe Race Officers set a characteristic Bass course, a figure-of-eight with several reaches, and two beats up to windward marks close to the shore (with challenging decisions easing up to round them in the shifts and lulls.) John Terry did his characteristic flying start, diving through the narrowing gap between the committee boat and the approaching boats on starboard, and the fleet stayed close out left in the light breeze, with Gareth Ede pulling out a small lead. On the second of the two laps, Gareth just out ahead struggled to get around the top mark (series of photos at the foot of the page!) letting John Terry and George Evans ride over him and stretch away. 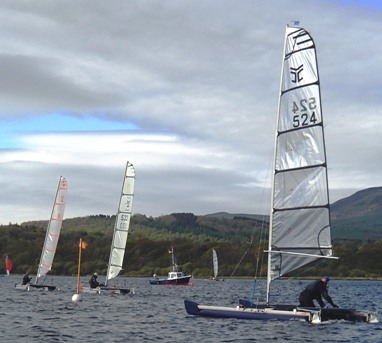 Stuart Ede gained out to the left up-wind to take third ahead of Gareth. Race 2 followed back-to-back, with a simplified course as the wind swung to the southwest and freshened, still light but allowing good boat speed. 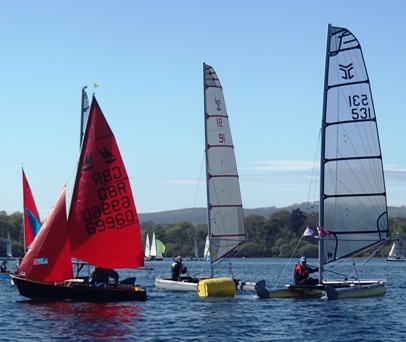 Three boats picked the port bias to the start, but this time John's attempt to dive at speed through the gap was blocked by Alastair Forrest, and he was then caught by the boats coming down on starboard. John recovered well to chase Stuart Ede (the other port starter) who had done well out to the left, to take a useful lead, held until a Mirror at the downwind mark pushed him violently to windward. Stuart lost track of the complicated unwinding to round the mark, forcing his later withdrawal. Behind, George Evans was coming up, but planted himself on the windward mark so firmly that he stopped Nigel Harrison getting around the same mark. Out in front, as the breeze picked up, John made a final tacking error to just lose the win to Gareth, and Alastair caught Chris Phillips for the third. Sunday morning had an almost still lake in sunshine, but puffs and patches built up until a delayed start was possible. The Race 3 fleet started tight on starboard, but Stuart, John and Gareth starting at speed midway down the line led the pack away. Stuart and Gareth went left up the beat finding stronger wind below the mountain, while John went right. At the top mark Stuart had a healthy lead on John and Gareth racing side by side around the rest of lap. 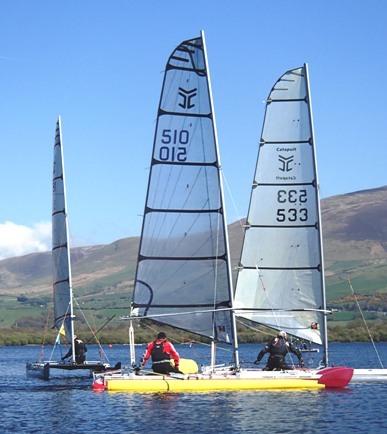 Stuart's lead was snatched in the short beat to the upwind gate, headed and having to tack, while John and Gareth were lifted through. 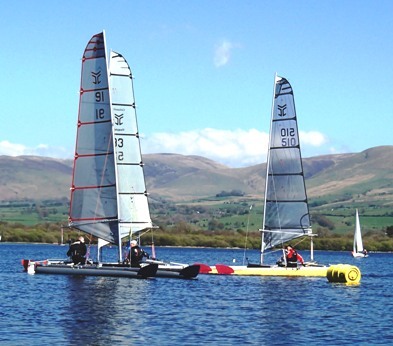 Again John split right,taking the lead at the windward mark, with Stuart and Gareth neck and neck a few boat lengths behind. On the final reach Gareth closed on John, with Stuart a few boat lengths behind. Rounding the final mark Gareth tacked immediately whilst John was headed and unable to make the finish line on one tack. Gareth tacked back onto starboard and looked set for the win over John (who needed a final tack onto port) but a final localised shift scuppered Gareth's chance and John took the win, with Stuart sneaking through as well for second. Behind, the rest of the fleet closed up amonst the Flying Fifteens, with Alastair taking the fourth from Chris. Race 4 had stronger afternoon breeze, for a course with a long beat and zig-zag reaches. Again a fast mid-line starboard start put Gareth and John ahead of the field up the beat, John leading for most of the first lap until Gareth clawed his way past on the reach. On the next lap John reached past Gareth and then with better upwind speed, pulled away for a comfortable lead to the finish. Behind, Stuart stuck himslf on the top mark, letting Alastair away for third, but recovering for the fourth. 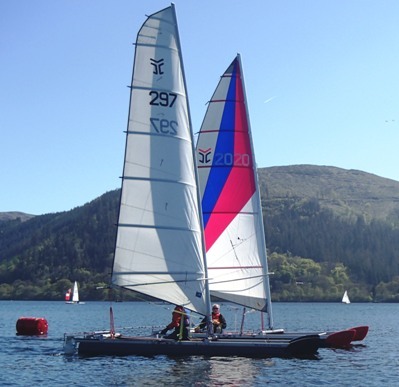 By Race 5 following back to back, the breeze had strengthened around 13 kn, gusting up to 20kn, allowing Gareth and John to gain from trapezing away from midway down the line. The complex course still gave two windward marks close to shore, with shifts and patches in the breeze. In the shifts, John led at the top mark, but Gareth then reached up below him and came in wider at the mark to tuck in to windward and pull clear upwind for a lead round the next two laps (despite stalling and stopping with one big windshift) for the win over John. Behind, Mike Gough welcomed the increasing breeze to battle ahead of George for two laps until George finally passed to take the third. The final race would decide the top five positions, but Monday morning came with an almost still lake and a delayed start for Race 6. Alastair and Stuart picked the start's marked port bias, easing away neck and neck, able to just lay the windward mark, with an apparent big lead. 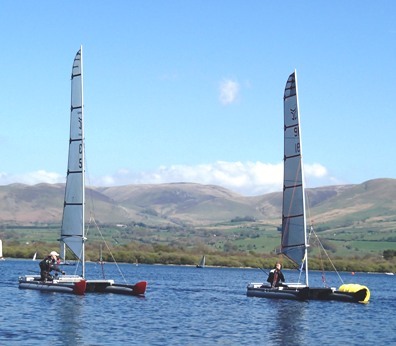 As they went gently along, to their horror they saw John and Gareth, way down to leeward, picking up freshening breeze, beating up quickly to take the lead at the top mark. Alastair pulled away from Stuart, chasing John with Gareth, getting away from the fleet in the light breeze. These three then looked back with a fresh horror, as Mike and Stuart overhauled them at twice the speed, bringing up fresher breeze. Fortunately the breeze also brought up a pack of local boats, enveloping the Catapults at the top mark, letting the front three away again down the final reaches. Alastair rode over Gareth to follow John in, and then Gareth was trapped rounding amongst local boats to let Stuart through for the third. The final race, in spite of its chanciness, decided the event places. John Terry won his first 2018 event from Gareth Ede with Alastair Forrest similarly plucking third from Stuart Ede on the last race result. Alastair Forrest and Gareth Ede.